US President Barack Obama is taking some delight in the Republicans' struggle to find a new House leader to replace John Boehner. Obama opened a fundraiser on Saturday with 1,000-plus donors by telling the audience that rapper Kanye West was thinking about running for House Speaker. The 54-year-old politician then went on to offer advice to West, joking about the Bound 2 hitmaker's recent proclamations that he had planned to run for president in 2020 and suggested the rapper's marriage to Keeping Up With the Kardashians star Kim Kardashian West would help him in his potential future career. Speaking in San Francisco's Warfield Theater ahead of Kanye's performance, he quipped: "In a little while you are going to hear from a guy who is thinking about getting into politics. "You've got to deal with strange characters who behave as if they are on a reality TV show. So you've got to be cool with that." And in reference to Kanye's 2010 album My Beautiful Dark Twisted Fantasy, he added: "This is the second tip, saying that you have a beautiful, dark, twisted fantasy. That's what's known as 'off message' in politics, you can't something like that." And Obama even poked fun at himself while questioning Kanye's chances of being voted into office. He said: "Do you really think this country is going to elect a black guy from the south side of Chicago with a funny name to be President of the US? That is crazy! That's cray." 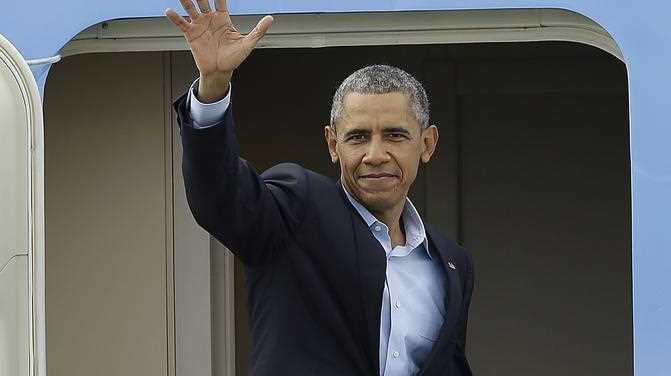 Obama was in San Francisco and Los Angeles on Saturday for four fundraisers. Obama encouraged the audience to be politically active and says he plans to remain so when his presidency concludes, saying "I'm just getting started".